Get the BEST discount and help for you and your family from Alamo Rental Cars on your next vacation. Alamo is giving some of the biggest DISCOUNTS in the car rental business with their new Alamo Printable Coupons. Charleston Apt. Alamo Car Rentals - 181 Airport Rd. The Blennerhassett Museum of Regional History was began in 1988, in order to save, collect and show the history of the region, even though the Daughters of American Pioneers' log house in the city park has been preserving their plethora of relics since 1910; with little space and short hours of operation. 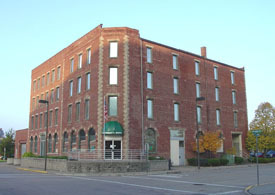 The closest other museum is in Marietta, Ohio, so this became the first professionally run publicly funded museum of regional history in the central west parts of West Virginia. This four story brick structure is a very interesting building with some history of its own. The Starr Grocer Company built these offices and warehouses in 1902, and after gaining some profits, doubled the size in the 1920s and was fortunate to get through the Great Depression, only to go under in the 1940s. The Guthrie-Morris Campbell company of Charleston bought the building in 1947, who would eventually sell it to the Blennerhassett Historical Park commission in 1983, and used the next two years to restore this grand old building with a federal EDA grant that was obtained by Rene Zabeau. The museum is an excellent showplace for the three floors of invaluable historical artifacts and objects of art from the Ohio Valley's history. These marvelous displays range from prehistoric Indian tools, weapons, household items and jewelry from 9000 BC to the old clothing, guns, oil paintings, furniture and military paraphernalia that once belonged to the state's first governor. There are automobiles of the early 20th century, 19th century jewelry and glassware that is anywhere from 60 to two centuries old and farm equipment. In their fabulous 18th to early 19th century exhibits, visitors can view a burning glass, maps, bubby pot, mourning fan and some of the valley's oldest manuscripts; all objects of the past that interest and intrigue us with their uniqueness. The Blennerhassett artifacts are considered some of the most valuable objects and proves to many that the museum is considerate of all historical memorabilia. There have been many locations in the state of West Virginia that were named Burning Springs, with two of the better known, locations of springs of water that held traces of gas that could be lit and burned until a strong wind would blow them out; hence the name Burning Springs. These unusual springs were considered natural wonders by the European explorers that visited here, but would eventually become important as places for oil, salt and natural gas. The Burning Springs in Kanasha County was actually owned by George Washington and General Andrew Lewis, who had bought the springs in 1775 as a real estate investment, but not for the unknown value of its fuel potential. This spring had been discovered two years before by the VanBibber brothers, the first Europeans that settled in the Kanawha Valley. Salt-works were developed at and by the springs in the latter 1700s, although the demand for oil and natural gas weren't developed until the mid1800s and their presence in the salt brine only seemed to be a nuisance to the extractors. The Burning Springs in Wirt County, a rural community or hamlet, would be the first center of the oil boom in the nation. The field that was developed around the spring contained many oil-dependent communities, many that would get up to a thousand residents before they would be destroyed by the Union forces during the Civil War. It is found by the scenic Little Kanawha River, with the wooded grounds of the 31 acre Burning Springs Park that contains the Burning Springs Museum, which has the former site of the restored Rathbone Well, the world's oldest extant oil-well. Yeager Apt. Budget Car Rentals - 170 Airport Rd. In 1798, Harman Blennerhassett, a rich Irish aristocrat, came to this island wilderness and settled, constructing a huge beautiful mansion; designed in the Palladian style like Mount Vernon was and it housed 7,000 square feet of space. The rooms were furnished with furniture bought in Baltimore and London, oil paintings, porcelain from Paris and oriental rugs. Some of the doors' hardware was made from silver and alabaster lamps were hung from the ceiling by silver chains. The estate had a 2.3 acre flower garden and two large lawns encompassed the main house. It was one of the most elaborate houses in the Virginias and believed to be the most gorgeous house west of the Alleghenies. Unfortunately, Harman would become involved in a scandalous scheme with Aaron Burr in 1806, and President Thomas Jefferson accused both of the men of plotting treason in trying to start an empire in the southwest. Blennerhassett left the island as quickly as he could, but was still caught and put in the Virginia State Penitentiary. Burr was tried and acquitted while Blennerhassett was released, and the lives of both of these men was ruined. The majority of historians believe that Burr was more interested in making northern Mexico, or later Texas, the place for his empire. The magnificent mansion was accidently burned to the ground in 1811, and what was left showed no signs of there ever having been such a splendid mansion. In 1973, archaeologists were able to discover its foundations and by using a program of careful architectural and historical research, the mansion was able to be recreated for the generations today. The interior restoration is still in progress and will be for some years to come. The island before Blennerhassett arrived can be followed back to the ice age some 9000 years ago and the hunters that frequented the region. Native American tribes have been living on the island since then and up until the 1780s when European settlers began coming to homestead. Numerous relics and artifacts have been uncovered from the ancient ruins and residents of the island and can be seen at the Blennerhassett museum. The island has more history to make its claim to fame since during the 1760s, the famous Delaware Indian, Nemacolin, would make the island his home. It was also visited by many famous figures that included; King Charles X of France, Walt Whitman, George Rogers Clark, Johnny Appleseed and Henry Clay. 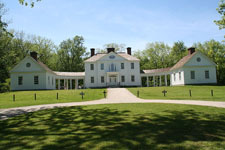 In 1986, the Putnam Houser House was moved from its locale in Belpre, Ohio, which was built in 1802. Enterprise will give you the best selection of new quality cars to choose from and the best staff to help you with that decision. Enterprise is giving their customers the BEST discounts in the rental car business, so why wait, go to the Enterprise web site today to get GREAT discounts. Appetizers; soup du jour; gratinee Lyonnaise is French onion soup with gruyere and parmesan cheese; jumbo lump crabcakes with napa slaw, whole grain crème; bleu bacon mushrooms with pepper bacon, caramelized onions & gorgonzola; Scottish smoked salmon flatbread with red onions, capers, dill crème, balsamic glaze & spinach flatbread; classis hummus with chick pea, tahini, herbed flatbread & cilantro oil; gulf shrimp cocktail with avocado, hearts of palm & fresh orange; fried calamari with lemon aioli, triple citrus cocktail sauce; grilled Carolina quail with ham & cheese grits, jus naturel. Signature Starter Salads; spinach with red onion, boiled egg, button mushrooms, poppy seed or warm applewood bacon dressing; Caesar with romaine, asiago, garlic croutons, roma tomatoes, roasted garlic Caesar dressing; baby greens with roasted peppers, artichoke hearts, kalamata olives, feta Dijon balsamic vinaigrette. Signature Dinner Salads; grilled flatiron steak with toasted pine nuts, red onion, roma tomatoes, gorgonzola walnut dressing; grilled Pacific salmon with artichokes, roasted peppers, kalamata olives, Vermont white cheddar, Dijon balsamic vinaigrette. Entrees: Steaks & Chops; 8oz. 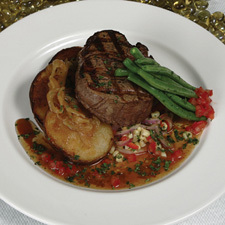 filet mignon with cabernet sweet onion demi-glace; tournedos au poivre with twin black pepper encrusted filets, cognac crème sauce; 14oz. Black Angus strip steak with espresso rub, saffron horseradish aioli; White Marble Farms pork medallions Milanese style with creminis, artichokes, capers; Australian baby lamb chops with extra virgin olive oil, chimicurri sauce. Entrees: Fowl; chicken olivada with garlic herbed cheese, sundried tomatoes, spinach, kalamata olive tapenade; Maple Leaf Farms roast duckling with apple cider glaze, grilled granny smiths; Cornish game hen with extra virgin olive oil, fresh herbs, jus naturel; walnut pesto chicken with marinated grilled breast, roasted walnut pesto. Entrees: Fish; grilled Pacific salmon with honey fresh lime glaze; East coast diver scallops with lemon zest beurre blanc, asparagus tips; Hawaiian tilapia with roasted red pepper crème, fresh chives. The Fort Boreman Hill looks out over the Little Kanawha River and the city of Parkersburg, West Virginia, although it was originally called Mount Logan, it would be changed after the first governor of the state, Arthur I. Boreman, a resident of Parkersburg in honor to him. During the Civil War, a Union garrison would occupy the hill, members of the 11th West Virginia Infantry, encamped here to look out over the two rivers that joined somewhere out in front of it, and a perfect place to have a bird's eye view of the rivers and any attacks by the Confederates. The hill or fort was where the city held their public hangings until 1868. The early years of the hill and surrounding area is unknown, but in the construction of the city's first official courthouse, the lumber from its slopes was cut down and floated across the Little Kanawha River. Who owned it initially is also unknown, but according to local legends, the area was purchased for twenty five cents and acre. In 1820, it had become the property of Francis Beckwith and his descendants would continue to live there until the early 1900s, and it had been named Mount Logan during that time; and as with the rest of the lack of info on it, no one knew why it was so named. Once again, this site has become something of a controversy since one report, states that in the Civil War period, or about 1861, the union troops that occupied the hill were from the 18th Ohio Infantry and in 1863, two more forts were in the plans to protect the railroad facilities that were located in Parkersburg; one on top of Prospect Hill, which is called Quincy Hill today and the other was at Mount Logan. The fort at Prospect Hill didn't materialize, but Fort Boreman was started in the summer of 1863. Details of the fort are lacking, but the best description that can be found is H. E. Matheny's Wood County, West Virginia in Civil War times. Matheny said that the plans called for two zigzag trenches, four feet deep in a semi-circle were to be dug around the hilltop. Big logs would be put on the outer wall of the fort, two feet high and two abreast; with stones and earth packed in between the logs, with space for portholes left so that the soldiers could see to fire their rifles. Some recent research has uncovered Civil War archives that show two different shapes for the fort, with one being a three-sided configuration and the other with five sides; and both were military drawings. Other structures that would be needed for the 150 man garrison would have to be a powder magazine and barracks, or some kind of habitat for the winters. It is believed that five cannons were placed here, but none were ever fired since no battles or skirmishes were ever committed here; although it is said that they were fired for saluting high ranking officials or maybe to honor a holiday. One type of occasion for celebration certainly would have been in June, 1863, when the territory became a state and it was at that time that the fort became named Fort Boreman, in honor of Arthur Boreman, the new governor. In August, when another ceremony caused the guns to be fired, one exploded and killed a soldier and seriously hurting another. Another event during this period would also created some notoriety. Thousands of troops were coming into Parkersburg and naturally the unwanted men and women that followed the troops for nefarious reasons. All of these conditions only added to the possibility of the dreaded and contagious disease of small pox, and although the city already had a quarantine area, it wasn't large enough to house all those that were coming here and getting the disease. Soon, the city leaders had to look for another and bigger place to put all these infirm. The actual site of the pest house isn't known, but city records state that in the spring of 1862, the city rented a house from Andrew Galvin and it is believed that the house was situated somewhere around the Fort Boreman area. The Fenton Art Glass Company started in 1905 with brothers Frank L. and John W. Fenton in an old glass factory that sat in Martins Ferry, Ohio and in the beginning, painted glass blanks that came from other glass makers; and eventually had to start making their own when they couldn't get what they wanted. Moving across the Ohio River to Williamstown, West Virginia, they constructed their own factory in 1906 and began producing glass in 1907. Frank was the designer and decorator, and from 1905 to 1920, the designs were influenced by the other two glass makers in the nation, Tiffany and Steuben. The many colors though were the work of Jacob Rosenthal, a famous glass chemist who was well known for his creating chocolate and golden agate glass. Near the end of 1907, the Fentons were introduced to carnival glass, which would eventually become a great collector's item. In the Great Depression and WWII, the Fentons produced practical items like mixing bowls and tableware due to various shortages. During that period, they developed new colors and at the end of the depression started making perfume bottles for the Wrisley Company, in 1938. The bottles were created in French Opalescent glass with the hobnail pattern. In 1939, Fenton began selling Hobnail items in milk glass, which would become their top selling line and helped the company to expand. In the latter 1940s, the top three managers passed on, and Frank and Wilmer C. "Bill" Fenton stepped up and took over the positions of President and vice president. During the following 30 years, they would continue to expand the company even though there were numerous factories closing down. In 1986, George W. Fenton, Frank's son, would become the company's president. In 1970, the company added their logo to the base of some of their pieces to distinguish them from their older pieces, and in 1974, Fenton began putting their logo on every thing they created. Pieces that were made in the 1980s had the number 8 put under the n in the logo and pieces from 1990 have the number 9. In August of 2007, the company sent out a press release announcing they would cease operations for the next few months; with plans to lay off 25 people immediately and in the ensuing weeks lay off the rest. Then, in December of 2007, they sent out another press release saying that due to a buying frenzy and internal restructuring, they would stay open until the spring of 2008. In August of 2008, George said that thanks to the buying frenzy, the company wouldn't have to close at all. Avis Rental Cars will help you choose the best vehicle for your trip and our friendly staff will help. On your next visit to Spokane, Avis Rental Cars will make your visit the best. Avis is offering their customers the BEST deals in the country with the new Printable Coupons. Yeager Apt. Avis Car Rental - 170 Apt. Rd. Avis Car Rental Clarksburg Benedum Apt. The Oil and Gas Museum is located in Parkersburg, West Virginia and is a repository of the history of the gas and oil that was discovered in this area first, and also the history of the region's fossil fuel that influenced the growth and settlement of much of the region. Both of these natural resources were discovered in West Virginia in the mid 1700s, by the first explorers, and George Washington purchased his estate of 250 acres because it did have gas and oil on it. That was in 1771, and made the first President the first petroleum industry speculator. By 1819, a thriving commercial oil industry was in business with the first wells drilled at Petroleum, West Virginia, outside of Parkersburg, then in early 1859 in California, West Virginia and in 1860, Burning Springs, West Virginia. The natural gas was moved in wooden pipes from the wells that would be used for manufacturing heat sources in the Kanawha salt companies in 1831. This is well the beginning of the oil and gas industry started in this country and the world soon followed. Oil was selling for $30 a barrel in 1860, and natural gushers were coming in at only 100 feet, which helped many West Virginia oil field owners become millionaires overnight. The wealth of the first oil barons would be used to influence the statehood for West Virginia during the Civil War; with many of the founders and early politicians being oil men; congressmen, governor and senators; who had made their money at Burning Springs in 1860 to 1861. This fantastic and exciting history is available at the Oil and Gas Museum in Parkersburg and was just documented in a book called "Where It All Began" by David McKain and Bernard L. Allen, Ph. D. The oil and gas museum is housed in the former historic building that was initially built in 1874, then burned and reconstructed in 1900. In the exterior exhibit area are Parkersburg pump jacks, still operating and a Spencer Machine pump jack with stones from the old Parkersburg City Building. The North Bend State Park is located on 2,459 acres along the north fork of the Hughes River close to Cairo, West Virginia and named after the sharp bend in the river that formed three sides to the original park boundaries. The North Bend Rail Trail is a 72 mile hiking and biking corridor that is managed by the park, and a new 305 acre lake was just finished and added to the park's amenities. There is a 29 room lodge, the rail trail, 9 cabins, basketball court, 49 camping sites, picnic area, gift shop, boating rentals, swimming pool, boating, miniature golf, fishing and hiking trails. The fishing streams and lake are abundantly stocked with plenty of fish so you will always have a great experience with all the other amenities. The rail trail allows horses and mountain biking as well and has become a very popular place to spend the day or the weekend or even a vacation. During the tough years between 1853 and 1857, before the Civil War, the Baltimore and Ohio Railroad had to go through some tough territory to build its stretch of rail that meant creating many bridges and tunnels. There are 13 tunnels along the North Bend Rail Trail and 10 of those allow you to travel through, with the other three abandoned by the railroad but still visible. The 337 foot long Number 10 tunnel is a raw or natural tunnel since it was bored through solid rock and is a majestic place to wander and view the many places that had the old drill markings. The Silver Run Tunnel, Number 19 is said to look something like a young woman in white, but could just be wishful thinking on the part of young men that have traveled the tunnels. Whatever the reasons, the tunnels are outstanding places to spend some time exploring, if you like that sort of thing, as many areas are likely to have small caves as well. There is a year round nature and recreation program at the park that provides visitors with a wonderful history of the culture and natural history of the region and the programs run from Memorial Day through Labor Day. They do have bike rentals available as there are also horse stables in the area that would be more than willing to rent you a pony or horse to travel the rail trail for added excitement. Charleston Apt. National Car Rental - 181 Airport Rd.